UPDATE 2015 GMT: Rebels say they have made a significant advance with the capture of the town of Ramouseh on the southwestern Aleppo front. The advance was enabled by the detonation of two tunnel bombs under regime military positions. UPDATE 1730 GMT: Both rebels and the Syrian military are putting out claims of successes in the continuing battles near Aleppo. 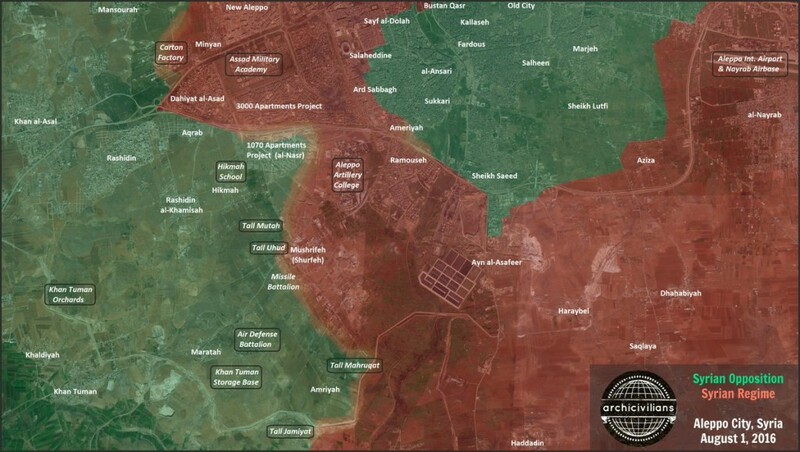 The rebels say they have taken the sawmills area to the west of the city (see map). A large tunnel bomb has killed scores of pro-Assad troops in the al-Ameria area (see map) to the southwest, near rebel advances since Sunday, according to local sources. Pro-rebel accounts also say their shelling has set fire to areas of the key artillery base, already surrounded on three sides, on the southwestern front. Pro-regime accounts had said earlier in the day that a counter-attack had retaken two hills. 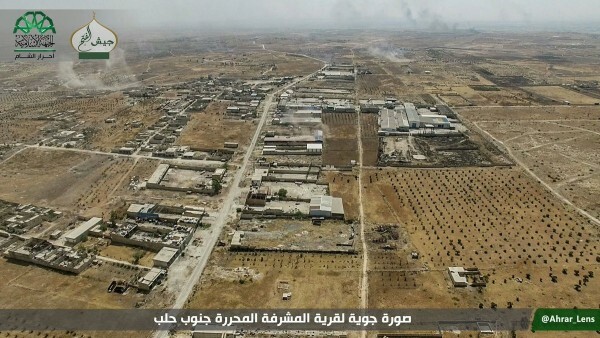 However, their claim that the 1070 housing complex near al-Hamdaniyah had been recaptured appears to have been false. UPDATE 0830 GMT: Russia continues to insist that there are “humanitarian corridors” for civilians and surrendering rebels to leave besieged, opposition-held eastern Aleppo city — even as residents, local journalists, and activists say that no such routes exist. Russia’s Defense Minister Sergei Shoigu announced the corridors on Thursday. The next day, Russian and Syria State TV featured interviews with women in a regime-controlled area near the line with the opposition districts, but it was never established whether those interviewed had actually crossed or whether they were residents of regime-held districts participating in a staged video. Since Friday, there have been no claimed images of residents leaving opposition areas. He asserted that rebels executed four civilians trying to leave. Activists say civilians are at risk of sniper fire if they move towards the regime areas, with several people already killed. ORIGINAL ENTRY: Less than a month after pro-Assad forces laid siege to opposition areas of Syria’s largest city Aleppo, rebels are not only threatening to break through but also to impose their own blockade on the Syrian military and its allies. On the second day of their sudden, large offensive, rebels said they took another village southwest of Aleppo, closing on an important artillery base. The rebels said they now have full control of al-Mashrifah, also known as al-Shurfa, after entering the area on Sunday. The village is near both the base and the regime’s supply route from Ramouseh. Pro-opposition activists noted that the rebels are now only a few kilometers from bisecting the pro-Assad forces on the southwest Aleppo front, making it difficult for the Syrian military, Iran, and Hezbollah to move men and supplies from other positions around the city. However, the remaining challenges are formidable. The artillery base is well-manned and heavily fortified, and the nearby military complex in Hamdaniyah is an essential position for the regime in the fight for Aleppo. The rebel offensive began on a 20-km (12.5-mile) front around the western side of Aleppo from the north — where the pro-Assad forces effectively cut the last route into opposition-held areas of the city in early July — to the south. While rebels bolstered their position in the north, pushing back pro-Assad forces from Handarat, the advances have been in the southwest. They began on Sunday with the capture of a school which is a staging area for the Syrian military, Iran, Hezbollah, and Iranian-led foreign militias, and continued yesterday with the occupation of al-Mashrifah, a hilltop, and an oil depot. 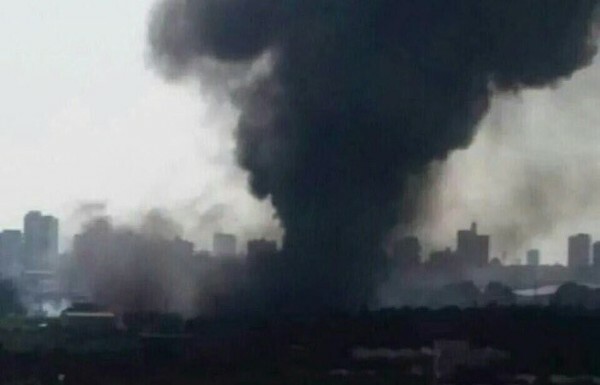 Russian warplanes, whose attacks have been essential to both the defense of the Assad regime and to its recent gains, were initially hindered in operations by the burning of tires by civilians, putting up thick black smoke over Aleppo. Russia’s General Staff insisted on Monday that all attacks had been repelled, declaring that more than 800 rebels — “led by Jabhat al-Nusra” were killed and that 14 tanks, 10 infantry fighting vehicles, and more than 60 vehicles with mounted guns were destroyed. Meanwhile, US Secretary of State John Kerry was still focused on the recent offensive by pro-Assad forces, establishing the siege of eastern Aleppo city, and the continued bombing by Russian and regime warplanes. It is critical, obviously, that Russia restrain both itself and the Assad regime from conducting offensive operations, just as it is our responsibility to get the opposition to refrain from engaging in those operations. These are important days to determine whether or not Russia and the Assad regime are going to live up to [an end of violence and resumption of political talks]. The evidence thus far is very, very troubling to everybody. Rebels are also claiming an advance in northern Homs Province, capturing areas near the town of al-Zara overnight. Rebels moved into al-Zara, expanding their pocket of control in northern Homs, in May. The Syrian opposition are claiming a regime chlorine gas attack on the town of Saraqeb in Idlib Province on Monday night. Activists and local journalists said the gas was delivered in air-dropped bombs and posted pictures and videos of victims with breathing difficulties. Helicopter targeted with chlorine gas Saraqeb in the countryside of Idlib. All of them had breathing and lung problems, spanning mild, moderate and severe symptoms, while coughing and having bloodshot eyes. They smelled of chlorine, and the civil defence workers who rescued them said the site of the attack also smelled strongly of chlorine. The claimed attack came hours after rebels downed a Russian helicopter in the area, killing three crew and two officers. PreviousFrance Analysis: How to Defeat the Islamic State?